The DN and JN Diamond series is the best solution for the industrial sector in pumping a vast range of fluids. They are synonymous with strength, reliability, performance and application flexibility. Designed according to the most demanding standards, they comply with the requirements of standard API 676. Suitable for pumping viscous and non-viscous products, with or without solids of any nature, they are an ideal solution for those seeking a standard product with advanced technology with unbeatable cost benefits in the current single screw pumps market. DN Series: the drive is coupled directly to the pump via a flange. This solution is extremely cost effective and compact, considerably reducing installation costs and simplifying maintenance. The forces generated by the hydraulic part are supported by the drive itself. Each drive used is adequately selected based on their specific technical parameters and are subject to numerous duration tests with heavy loads. The DN series is the reference point for almost all pumps installed in the industry. JN Series: the drive is connected to the free bare shaft inlet via a flexible coupling. This configuration is the best solution in terms of performance and durability. All the forces generated by the pump are absorbed by the bearings in the housing. These bearings have very high resistance against loads. They are assembled with extreme precision on the highest quality manufactured parts. It is the best solution when you want to guarantee duration and reliability, yet with greater installation space requirements. The bearing unit designed by us is modular and can be adapted to a DN series pump with lantern after a pump with the JX series block housing. It is state of the art for this type of installation. The pin-type joint, the actual heart of the single screw pump, is the best solution of its type on the market. It offers greater duration, reliability and reduced maintenance costs, managing to combine extreme compactness with unrivalled strength. Its particular manufacturing enables the sub-division of axial loads and torque in different elements, making it one of a kind. As well as the above, replacement of worn parts is cheap thanks to the bushes in the worn zones, avoiding costly replacement of parts (rotor, drive shaft, and female drive shaft. To resist high pressure in the pump casing up to 12 bar, the pin can be hydraulically balanced. The base plates, characterized by considerable thicknesses are very strong. Available in carbon steel or stainless steel. They can also be provided according to standard API 676, in a trolley version, with anti-vibration housing or on skids, according to the client’s specifications. The parts in contact with the product of the DN and JN Diamond Series pumps can be manufactured in various materials. From the version in cast iron to stainless steel (AISI 304 and AISI 316), as well as other materials on request such as Duplex and Super Duplex. Also, in the version in cast iron, the rotating parts are still manufactured in stainless steel AISI 420 or on request in AISI 304 / AISI 316. Tensional stress and pulsating flow are very low. The centrifugal effect is reduced to a minimum thanks to the low operating speeds and mainly the axial development of the pump. Different sealing systems can be installed, each solution being suitable to specific usage. The types available are: mechanical seal, single outer mechanical seal, single mechanical seal with quench, back to back double mechanical seal and double mechanical seals in tandem, Packing seal and flushed packing seal. The sealing systems are all interchangeable on the standard pump. Each solution was carefully engineered while taking into consideration all the operating conditions. As well as changing the sealing system, you can also install various types of mechanical seals based on the application. The compartments are suitable for installation of the seals manufactured according to the standards ISO EN 12756. As well as this, it is possible to use cartridge seals from the main manufacturers, also available according to standards API 682 category 1. Al the drives which are installed on the Diamond series have been tested for long periods and subject to strict and rigorous technical checks. 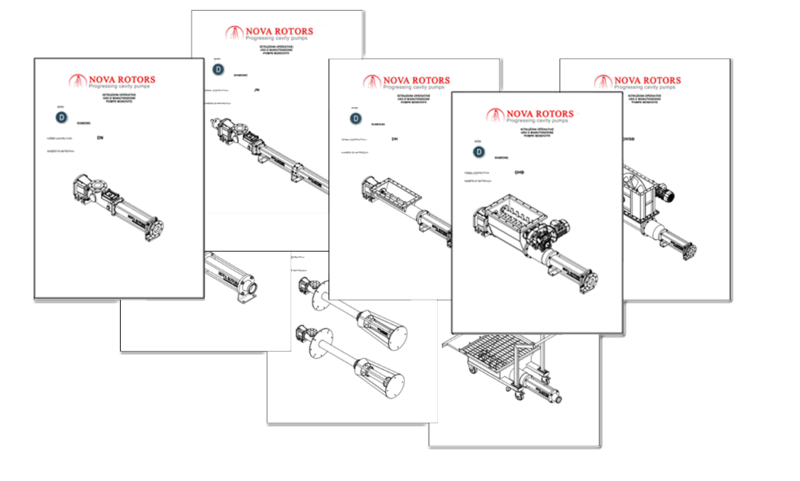 We can install both electric and hydraulic motors. All the models of reducers and variators present determined characteristics in terms of strength, size of the bearings and the quality of the gears. Maximum performance level, exceptional operating efficiency thanks to the optimum volumetric yield and high pressure and is consumption reduced to a minimum. All the Diamond series hydraulics efficiencies were calculated to guarantee the maximum found on today’s market. The Diamond series is designed to ensure easy maintenance and normally require the replacement of a minimum number of components. 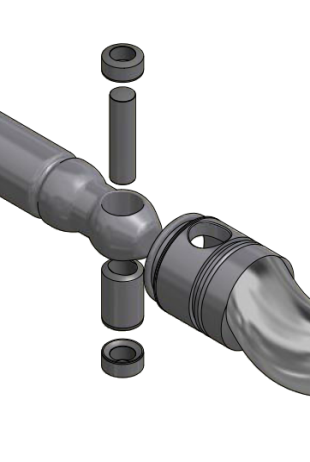 In particular the joint bushes allow the replace of the same without having to replace shafts and rotors. The costs of maintenance are really reduced. 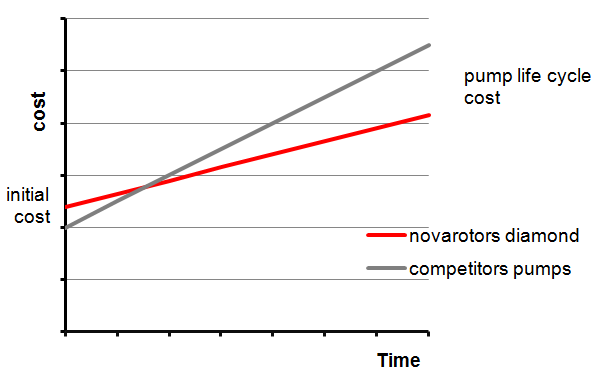 The cost of the pump, considered in his full life cycle, is highly competitive.